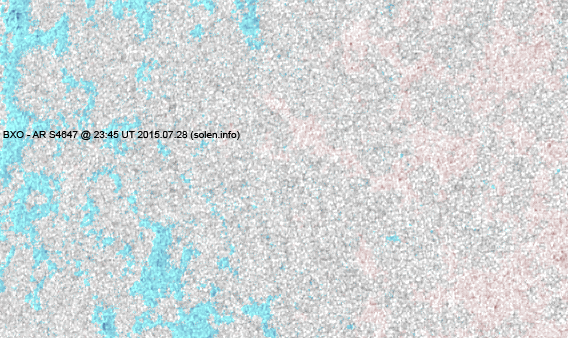 Last major update issued on July 29, 2015 at 04:20 UT. The geomagnetic field was quiet to unsettled on July 28 under the decreasing influence of effects from CH678. Solar wind speed at SOHO ranged between 381 and 457 km/s. 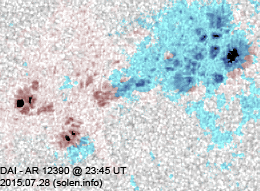 Solar flux at 20h UTC on 2.8 GHz was 101.1 (decreasing 8.5 over the last solar rotation). 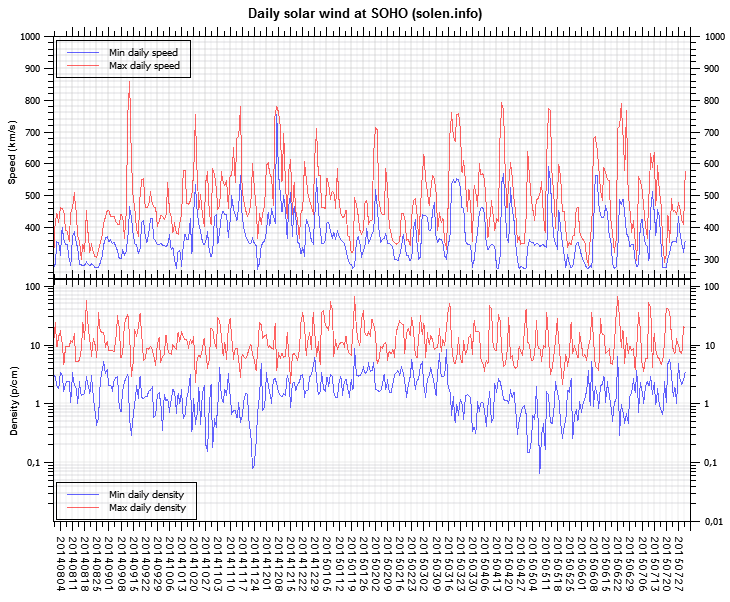 The 90 day 10.7 flux at 1 AU was 120.0. 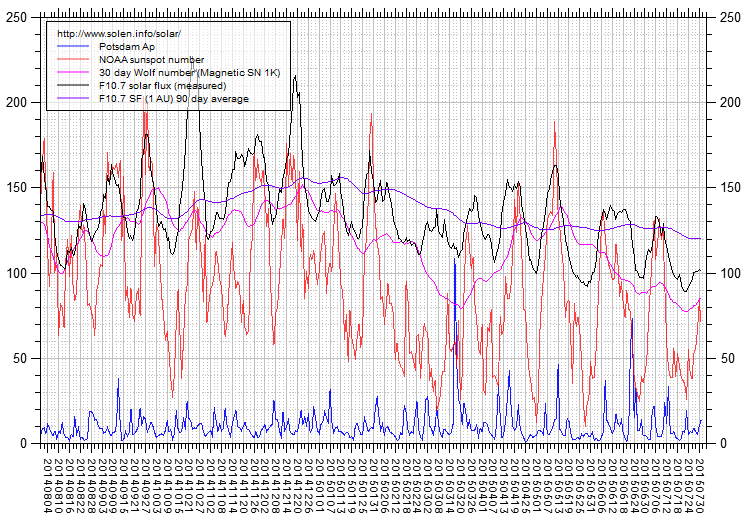 The Potsdam WDC planetary A index was 7 (STAR Ap - based on the mean of three hour interval ap indices: 6.9). 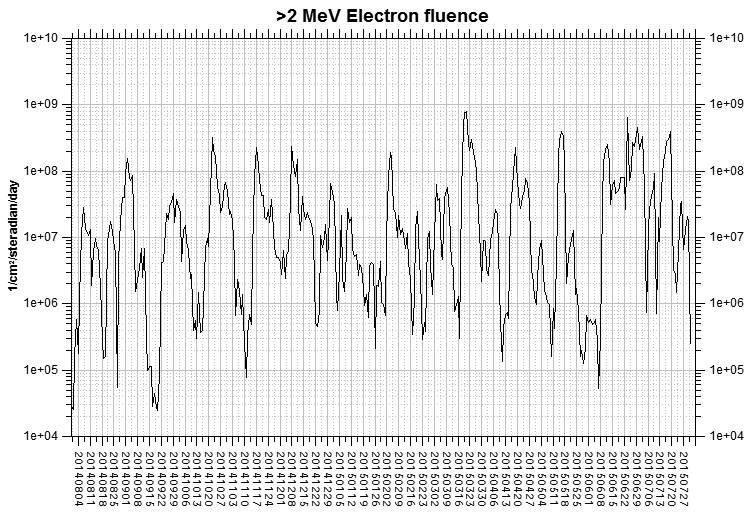 Three hour interval K indices: 22223122 (planetary), 23332312 (Boulder). At the time of counting spots (see image time), spots were observed in 7 active regions using 2K resolution (SN: 139) and 7 active regions using 1K resolution (SN: 107) SDO images on the visible solar disk. Region 12389 [S11E08] decayed slowly and quietly. 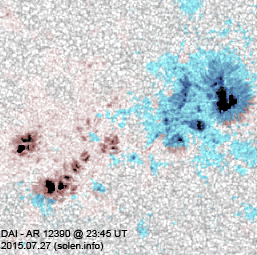 Region 12390 [S15W26] gained small spots while the largest spots lost penumbral area. The region was quiet and stable. 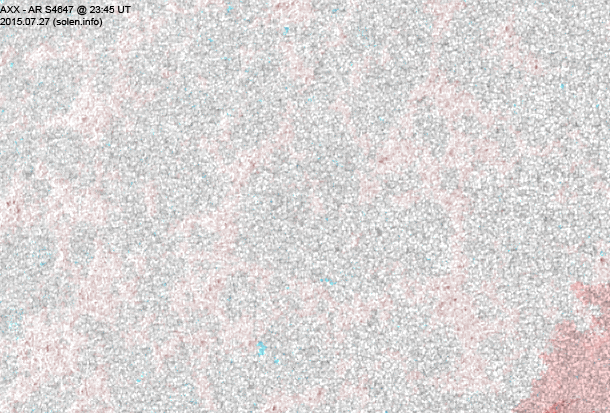 Region 12391 [N07E58] was quiet and stable. S4645 [S04E65] was quiet and stable. S4646 [N15E71] was quiet and stable. S4647 [N15E42] lost some of the leading polarity spots and gained trailing polarity spots. New region S4648 [S22E80] rotated into view. 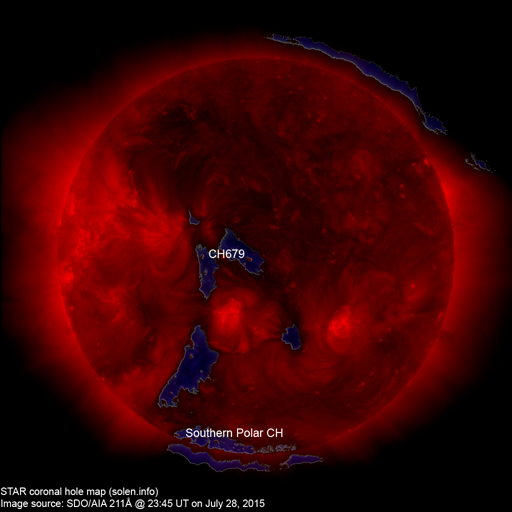 A recurrent trans equatorial coronal hole (CH679) will rotate across the central meridian on July 28-29. 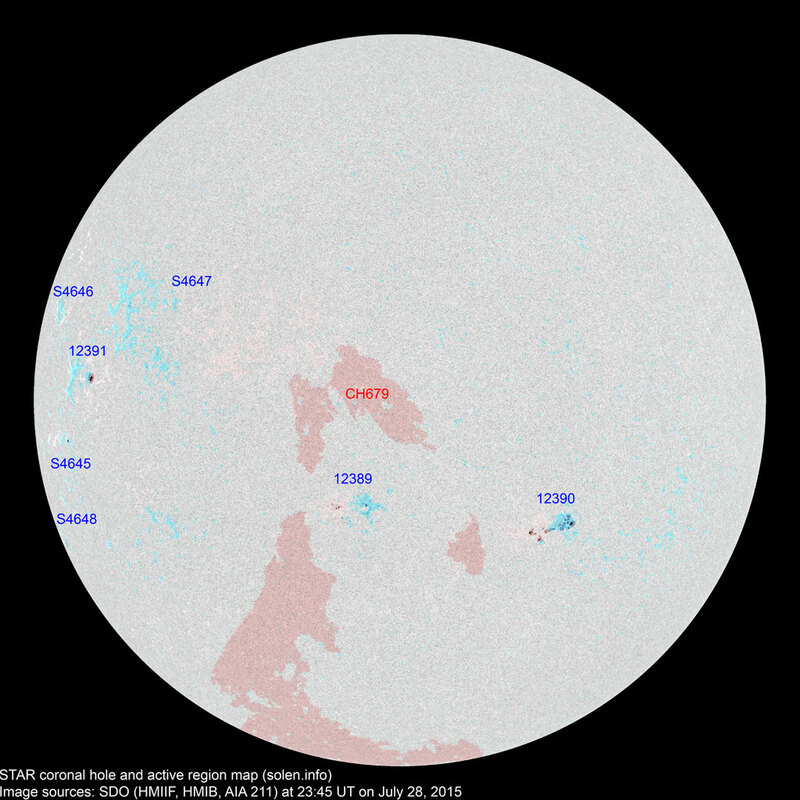 The geomagnetic field is expected to be quiet on July 29-30. Late on July 31 and on August 1 a high speed stream associated with CH679 could cause quiet to active conditions. 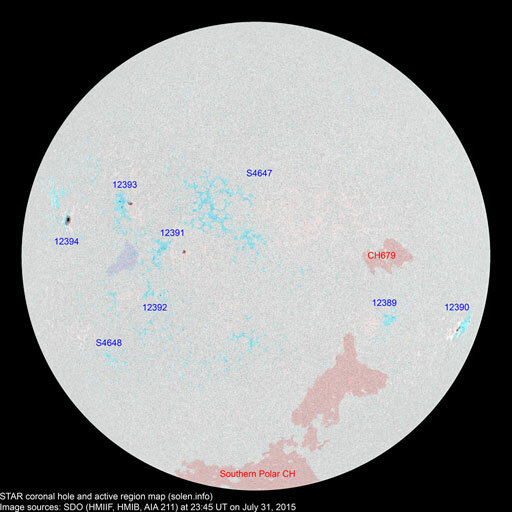 CH679 has changed considerably over the last rotation due to the development of AR 12389 and may have become less capable of causing a significant geomagnetic disturbance.